Venezuela In Turmoil For Lack Of Flour, Milk And Diapers : Parallels Protests continue to rock Venezuela as peaceful marches have turned violent.The list of grievances — rising crime, inflation — is long, but the main one for many is the scarcity of basic food. 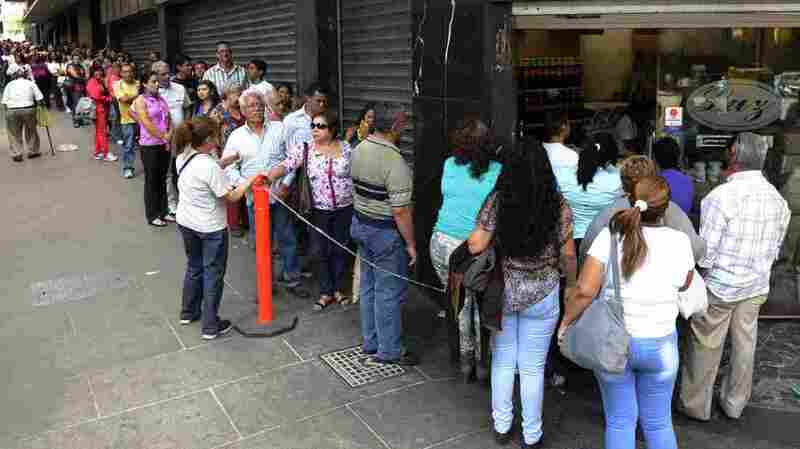 People line up to buy goods at a store in Caracas, Venezuela. Today, he's looking for sugar, and he's asking his friend if he knows if any shipments have arrived. As he talks on the phone, his wife Lisbeth Nello, is in the kitchen. "The things that are the scarcest are actually what we need the most," Nello says. "Flour, cooking oil, butter, milk, diapers. I spent last week hunting for diapers everywhere. The situation is really tough for basic goods." Student-led demonstrations have been roiling Venezuela for more than a month. At least 28 people have been killed and dozens wounded in confrontations between security forces and those who have taken to the streets. The list of grievances — rising crime, inflation — is long, but the main one for many is the scarcity of basic foodstuffs. As with everything in Venezuela, the reasons given for the food shortages depend on political affiliation. The government says it's the result of unscrupulous businessmen waging an economic war and hoarding by regular people afraid of shortages. Those in the opposition blame a system that imposes price controls, the lack of money to buy imports and problems in the supply chain after the expropriation of farms and factories by the socialist government. Whatever the reasons, the shortages have meant that Nello spends a lot of time in long lines. It's usually the women who have to go to the shops and her house is no exception. "When we find out there is something we need in one of the supermarkets, we have to jump and get up very early to get down there," she says. The family lives on a hillside with only makeshift stairs to get to their home. It's a long way to the market, and once there, the lines often take hours, with hundreds of people standing in them. She says she feels they have become like ants, always carrying supplies home. An informal barter system has developed as well, Nello says. If she has extra coffee, she can trade it for cooking oil. It's a way of avoiding the long waits for staples. "We are always helping each other," she says. "We are sending messages to other members of the family when we find out something is in the market." All supermarkets these days have security to make sure that customers stay in line and obey government-imposed limits on what they can buy, and that no one causes a riot. In the slum of Antimano, women are standing in line in front of a shop. They say they don't know what's on offer, but they are queuing anyway, a sign of how worried people are that they won't get what they need. Inside the market, the manager, Roger Escorihuela, takes me around and points out that the shelves are not bare. There are cereals, eggs and pastas and fancy jams, but the staples that are subject to price controls — black beans, butter, corn meal, the list goes on — are missing, he says. He acknowledges he never knows what will be delivered each day by his trucks which is why people have to phone around to find out what's available. But he insists there is no shortage, and everyone gets what they need, eventually. At least this day, he's proven right. A woman walks in looking for toilet paper, but the shelves are bare. Then she spots the last roll, fallen behind the shelf. She gleefully grabs it and rushes to pay.